Replacing kitchen cabinets, bathroom vanities, or built-in units within your home or business can be a costly and often out-of-budget expense. This is why we have a dedicated crew of professionals that can provide a complete refinishing of those same units at a fraction of the cost. If quality is what you are looking for, then you have come to the right place. We strive to be the best at what we do, and cabinet refinishing is no exception. Done correctly, the outcome of refinishing cabinet units is often such a drastic change that customers don’t recognize their own home! 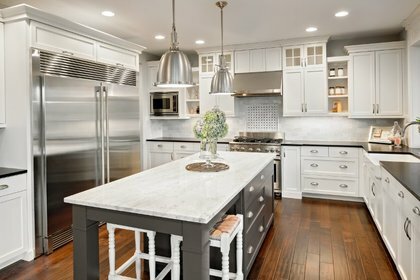 We use only the best techniques, practices, and materials to complete this refinishing work. When completed, our customers have a product which looks new and is finished to last. Depending on if the existing cabinet or vanity has been previously painted, stained, or is raw wood, the sequence and work steps associated with the refinish changes. If, for say, you have existing oak cabinets which have a varnish finish (or have stain / lacquer applied) and you are wanting your cabinet finish to be white (which is popular right now), this would be an example of our refinishing sequence. Sand (by hand), using a low-grit sand paper, all surfaces of the cabinets which are to refinished. This process cleans the existing surfaces and provides some texture for the primer to adhere to. After dusting, apply an primer or undercoater to all those same surfaces. The primer is applied to lock-in the existing wood stains and colors as well as provide a good surface for the paint to adhere to. Wood patching products (Bondo or similar) are then applied to any previously damaged surface areas or deep graining within the wood. This will allow the final product to be smooth and consistent. Sand (by hand) the primer and patching products to create a smooth surface. After dusting, apply any caulking which is needed to fill un-desired cracks or seams which may have occurred in the cabinets. Apply your finish coats, sanding in-between coats to ensure a smooth and even finish. The finish coats and application method vary depending on the customers desired outcome and the scope of the project. A spray application could be best using a solid color lacquer finish or a hand-brushed water or oil based paint can be applied. These are decisions which we will discuss with each customer and work towards their desired finish.